Hello and welcome to the 289th installment of the SWD. Syrian Arab Army reportedly captured Al-Mushayrifah, Tell al-Warid, Al-Tamah, Tell al-Maqtae, Al-Maghara, and Al-Dijaj south of Abu Dali from the rebel factions in the northern Hama. 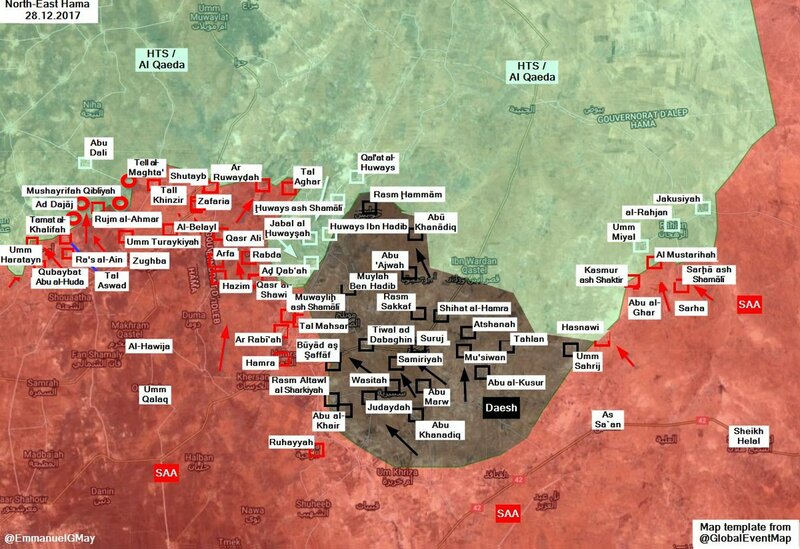 Hayat Tahrir al-Sham’s Ibaa News Agency claimed that more than 60 Syrian Arab Army’s elements were killed during the clashes in the northern Hama. The agency quoted Abu al-Hassan Farouq, military commander in the Northern Hama operations room, who said that the rebels ambushed a group of SAA‘s soldiers that attempted to infiltrate an area near Tell al-Maqtae. Abu al-Hassan also said that an improvised explosive device destroyed SAA‘s vehicle carrying elements in the village of Al-Mushayrifah. Hayat Tahrir al-Sham’s tanks shelled Syrian Arab Army’s positions at Al-Zara station, southern Hama. Syrian Democratic Forces and Islamic State clashed near the village of Al-Bahra in the eastern Deir al-Zour. According to the Islamic State’s Amaq Agency, two elements of the Syrian Democratic Forces were killed and seven wounded in the clashes, as well as a bulldozer seized. Furthermore, another statement from Amaq Agency stated that Islamic State’s suicide attack targeted a gathering of SDF‘s elements near Al-Bahra village. Syrian Arab Army’s artillery shelled Jisreen and Al-Nashabiyah, while the Syrian Arab Air Force targeted Ain Terma in the East Ghouta. Hayat Tahrir al-Sham’s evacuation from Beit Jinn pocket to Idlib was postponed till tomorrow, reportedly at the group’s request. Buses arrived yesterday in Sasa, southwest of Damascus, to evacuate Hayat Tahrir al-Sham’s fighters and their families from the pocket to Idlib. Syrian Arab Red Crescent continues to evacuate wounded fighters from Beit Jinn towards Idlib. National Defense Forces seized a vehicle reportedly loaded with various ammunition and explosive materials heading from Daraa towards the rebel-held East Ghouta. Islamic State clashed with Al-Hashd al-Shaabi (Popular Mobilization Units) in the village of Al-Qawshijia. According to the Islamic State’s Amaq Agency, two elements of Al-Hashd al-Shaabi were killed in the clashes. Islamic Emirate of Afghanistan (Taliban) raided Afghan Local Police’s checkpoint in Imam Sahib district, killing two and wounding two elements of the local police. Islamic Emirate of Afghanistan’s sniper killed an element of the Afghan Local Police in Baghlan-e-Markazi district. Afghan National Security Forces killed one and wounded two fighters of the Islamic State in the province. Islamic Emirate of Afghanistan’s improvised explosive device destroyed Afghan National Army’s vehicle in Sirkani district. Islamic State conducted a suicide attack on Tebyan cultural center in Kabul, killing 41 and wounding at least 80 civilians. Islamic State’s Amaq Agency claimed responsibility for the attack by saying that the attack targeted “Shiite” and killed and wounded 220 individuals. Islamic Emirate of Afghanistan attempted to assassinate Ihsanullah, Afghan National Army’s commander in the city of Kabul. Ihsanullah was seriously wounded in the attack. Islamic Emirate of Afghanistan claimed that Ihsanullah is an active commander in the United States’ base in the city of Kabul. Islamic Emirate of Afghanistan’s improvised explosive device destroyed Afghan National Police’s vehicle transporting elements to Saydabad district. The explosion reportedly killed seven and wounded three elements of the police. Islamic Emirate of Afghanistan attacked a group of Afghan National Police’s elements in the city of Khost, killing two policemen. Islamic Emirate of Afghanistan’s improvised explosive device targeted Afghan National Army’s foot patrol in Qalandar district. The explosion killed two soldiers. Afghan National Security Forces’ attack in Alisher directorate was repelled by the Islamic Emirate of Afghanistan. Islamic Emirate of Afghanistan’s improvised explosive device exploded inside an intelligence office in Herat International Airport. According to the Islamic Emirate of Afghanistan, the explosion killed two and wounded four United States Army’s soldiers. Afghan National Security Forces conducted operations against the Islamic Emirate of Afghanistan in Qarabagh district, killing seven and wounding eight fighters of the group, as well as destroying a vehicle. Islamic Emirate of Afghanistan raided Afghan National Army’s checkpoint in the city of Ghazni, which resulted in clashes between the two for several hours. Islamic Emirate of Afghanistan managed to capture the checkpoint and kill eight soldiers in the proces, as well as injure over a dozen of soldiers. IEA seized six assault rifles, two PK machine guns, an RPG, a grenade and ammunition. IEA then engaged Afghan National Army’s reinforcements, reportedly killing six soldiers and destroying two tanks with RPGs. IEA reported death of one of its fighters due to the clashes in Ghazni. Islamic Emirate of Afghanistan assassinated Baz Gul, member of the provincial council in Muqur district. Similarly, an element of the Afghan Local Police was assassinated in the same district. Afghan National Army and Islamic Emirate of Afghanistan clashed in Qarabagh district, after the former attacked the latter’s positions in the district. Islamic Emirate of Afghanistan launched a counterattack after Afghan National Army’s attack, which resulted in killing of four and injury of six soldiers. Islamic Emirate of Afghanistan’s improvised explosive device destroyed Afghan National Police’s vehicle and killed four policemen in the city of Ghazni. Islamic Emirate of Afghanistan’s sniper killed an element of the Afghan National Police in the city of Ghazni. Afghan National Security Forces’ operations against the Islamic Emirate of Afghanistan in the province killed seven and wounded four fighters of the group. Furthermore, three Islamic Emirate of Afghanistan’s fighting positions were destroyed during the operations. Afghan National Security Forces killed four and wounded two fighters of the Islamic Emirate of Afghanistan in Marjah district. Islamic Emirate of Afghanistan captured Afghan National Army’s checkpoint in Yakchal area of Jerash district, killing seven soldiers in the process and forcing others to retreat. Islamic Emirate of Afghanistan seized a PK machine gun, two assault rifles and other equipment from the checkpoint.